This behind-the-music story of Frankie Valli and The Four Seasons will take you from the streets of Newark to the heights of stardom. Follow the incredible journey of four guys bound by one dream — to make it to the top without giving up, selling out or forgetting where they came from. Experience electrifying performances of golden greats that took these guys all the way to the Rock and Roll Hall of Fame: "Sherry," "Big Girls Don't Cry," "Can't Take My Eyes Off You," "My Eyes Adored You" and more. Be sure not to miss this unforgettable, Tony Award-winning Broadway musical this season! 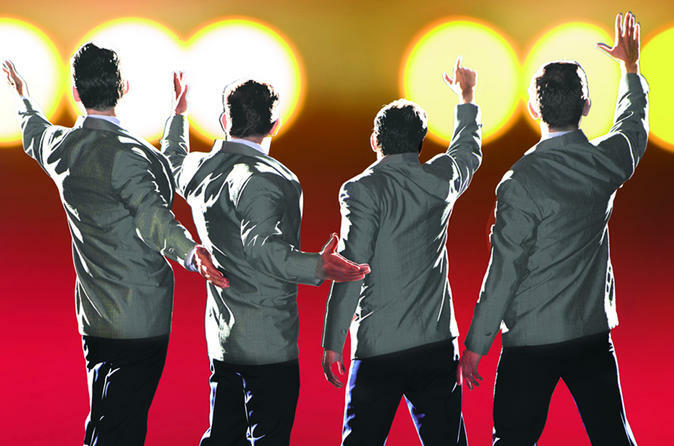 Jersey Boys is the story of how a group of blue-collar, working-class boys from the wrong side of the tracks became one of the biggest American musical sensations of all time--Frankie Valli and The Four Seasons. They wrote their own songs, invented their own sounds and sold 175 million records worldwide...all before they were 30! This new musical features their beloved hit songs "Sherry," "Big Girls Don't Cry," "Rag Doll," "Oh What a Night" and "Can't Take My Eyes Off of You," just to name a few. Make your vacation in New York complete with the Tony Award-winning Jersey Boys on Broadway!